VW is one manufacturer that has consistently holding a one make race series for all aspiring racers. While Toyota did try it for a short while with the Etios cup, they stopped it soon after the second season. VW on the other hand has been having the Polo cup, followed by the Vento cup every year on. 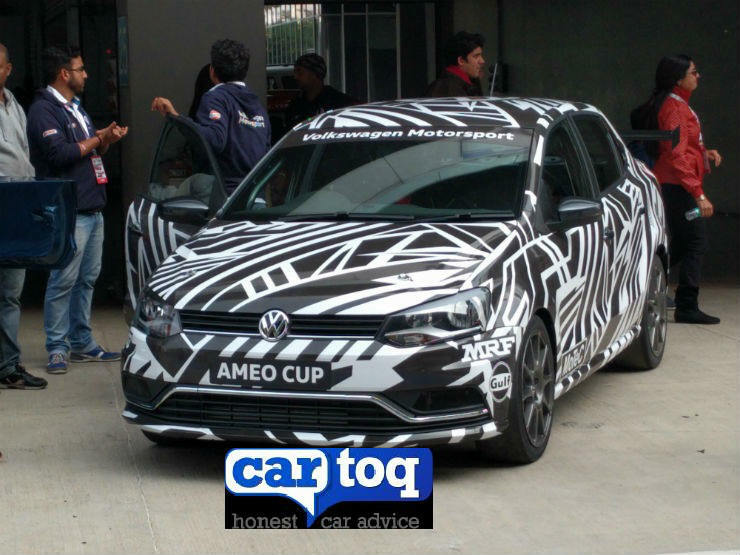 This year will see VWs new compact sedan, the Ameo receive the race car treatment. 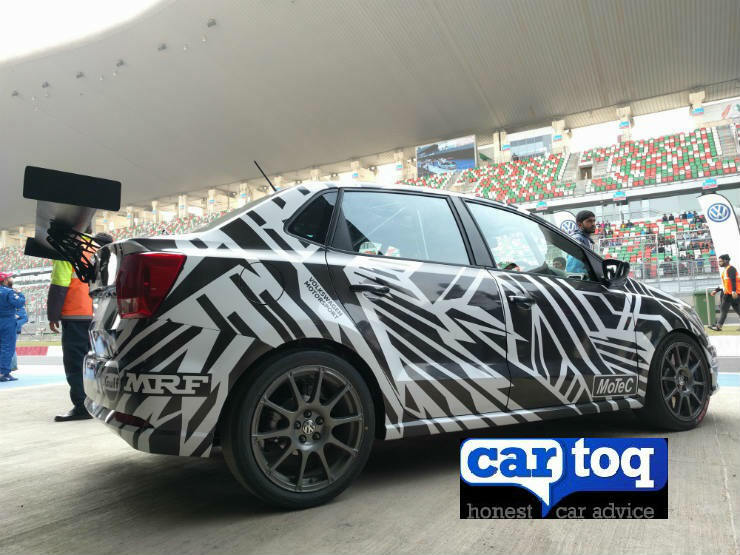 The vehicle was spotted testing ahead of the season opener at both the BIC and the MMSC track in Chennai. Now for some interesting information. While the current Vento Cup car is powered by a 1.4 liter TSi unit which is mated to a 6 DSG, the Ameo cup car is rumoured to be powered by its larger brother, the 1.8 liter TSi which does duty on the GTi. The current 1.4 liter engine churns out 177 Bhp and 250 Nm. The engine is super as well as turbocharged to make sure there is no lag anywhere. The new engine is expected to make well over 200 Bhp and will come mated to a sequential gearbox, rather than a DSG. The vehicle will also get a digital instrument cluster powered by Motec and will also provide telemetry data. Details on the ECU, the suspension and the brakes are not yet known, however this is expected to be among their most extreme race cars they have built. The body has been spotted in a wrap which doesn’t show if there are any aerodynamic changes which have been done to the car. What is clear is that the Ameo Cup car will sport a giant wing at the back, something that actually makes the car look sporty. It will mostly sit on 17″ rims and have slick tyres. To compete in the race, the vehicle will be fitted with FIA spec rollcage, OMP seats and a 5-point racing harness. VW will reveal the specifications of the car once the testing is over with.